Did you know it’s possible to get Camfrog instant messages sent to your iPhone screen if you use Camfrog for Mac OS X? The new Camfrog client already comes with Growl. 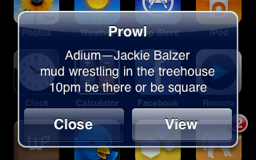 To get these Mac OS X Growl IM alerts sent to your iPhone all you have to do is download Prowl to your iPhone via iTunes. Once Prowl is set up with Growl any IM that is sent to your Mac via Camfrog will show up on your iPhone. We hope to release a Camfrog iPhone app next month so you’ll be able to get Camfrog messages with our own iPhone client soon also. I have use Windows Mobile 6.1 and use Dell x50v. I have been using Prowl with Camfrog for a while now. It works great. The only problem I have is that i doesn’t send notifications after about an hour of idle time. I haven’t figured out why yet. May I suggest to add for BlackBerry? Almost everybody have blackberry. You can give a shot for it. jm_one, we don’t support Growl yet on our Windows client so I’m not sure if it would work or not for him. Great Really Nice Works !